Here I’ve decided to continue to be predictable and put up a couple of videos by an originally all-female, German goth/synth band from the 80s, Xmal Deutschland. Xmal Deutschland formed in 1980, in Hamburg and was led by Anja Huwe. I’ve loved the Slits for a few years now, not as many as I should have, because I was a late comer to their music, but long enough that their songs are pretty embedded in my bones. Living in New Zealand their music fitted in neatly with the rest of my mental history of English & European grrrl punk/post punk; I knew their influence on riot grrrl and felt duly outraged at their lack of acknowledgment, both in the “punk era” & today. Their music made me excited, confused and intrigued. I liked the Peel Sessions better than Cut, but could completely see the importance of Cut, and the fact that the Slits had busted down the convention of what punk “was”, and forged their own amazing & influential style, of course not to mention the fact that they started out as an all-female punk group who wrote, played and controlled their own music, and the lead singer was only 14 years old! However, it was not til I got to London that the whole thing really, fully clicked into gear for me. I mean, you could say that about most of the UK based music I listened to really. And this is not to say you can get everything you need out of this music listening to it in a far away country like New Zealand, and comprehending it through the filter of your own hometown, but I have to say there is something romantic (and completely, shamelessly idealistic & nostalgic I’ll readily admit) about looking out the window of my North London flat on a grey Autumn Sunday afternoon, at the bricks & the chimney pots and the kids playing in the middle of the streets, listening to the mixture of accents & languages, watching the crows & the pigeons stalk around the rooftops and going ahhh….right….now I get what they’re saying. “Newtown where everybody goes around sniffing televisena Or taking footballina…”. Walking around neighbourhoods like Brixton and hearing the reggae on the streets, mingled with punk coming out of the squats. “Dreaming on a bus…” and seeing tough as nails young girls who talk loud, wear insane outfits and act bolshy (this happens in NZ too of course, but different accents, different contexts). Zoe Street Howe’s book, as well as being a thorough and comprehensive history of the Slits, is an amazing snapshot of London in the late 70s early 80s. If you’re feeling as romantic about London as I am, I would recommend you read this book despite what you do or don’t know about the Slits. Strangely enough, given the fact that they are so often name-checked by many artists today as being inspirational musically, politically & personally, the Slits have not had any books written solely about them up until now. Particularly strange as they are so important and intertwined with punk rock history, post-punk & also the formation of riot grrrl. Oh well, I hopefully this will be the first of many, and I’m glad Zoe kicked it off. Recently I read Meaty, beaty, big and bouncy! : classic rock and pop writing from Elvis to Oasis, which included articles by rock critics such as Julie Burchill and Nick Kent. Zoe Street Howe’s writing doesn’t have the painfully honed personality of these critics, which makes it an easy read, and you don’t feel irritated by an opinion forced down your throat. But at the same time, who can deny the enjoyment gained from reading a purely opinionated piece of music journalism? Who doesn’t like feeling the passion fairly burning up the page? I would’ve liked to hear more about Zoe’s own experience of listening to the Slits, and her opinions about various periods in their history, hear more of her voice in her writing. I guess that’s one of my only criticisms really. 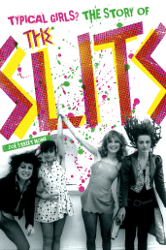 One of the things I enjoyed most about the book was the fact it gave the opportunity to find out what other musicians thought of the Slits music. Up until now, even “pro-Slits” articles that I have read focus on other aspects, such as their crazy antics & the horror they inspired in the general public. Only very occassionally have I read about people actually analysing their music, because most often they’re dismissed as not being able to play. Friends such as Keith Levene (the Clash, PiL) and Don Letts, among others, offer up insights into the Slits musical intentions, and analyse their playing as is the norm in articles written about male musicians of the era, but rare to non-existant when it comes to the Slits. So for example, you can read about Levene’s thoughts on Viv Albertine’s playing, after he gave her a few guitar lessons and she went out and did her own thing, experimenting & creating her particular style. We discover Ari Up was a musician before joining the Slits & played piano – so much for her just being an attention-seeking hellion as people would have you believe. Strictly-for-the-fan’s details, such as how Tessa felt about singing “Adventures Close to Home”, stepping out of her role as the silent, mysterious bass player are also revealed. 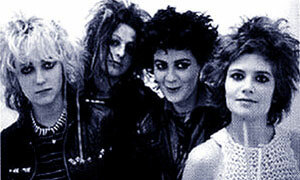 The Slits connections with other female musicians of the era such as the Mo-dettes & Nina Hagen are similarly explored. Actual analysis of female punk musicians – amazing! ok, well, I’ll stop rambling now. This is a great and much overdue book, about an extremely important band that is finally getting its dues. Parallel Dance Ensemble’s single “Weight Watchers” feat. Coco Solid and Bobbi Soxx. Ism Records. Directed by Lisa Dunn. Editors: Yaser Naser and Morten Leirkjaer. Producers: Gilly Luxton and Mel Whyte. DOP: Neal Wagstaff. Makeup: Riki Anderson.